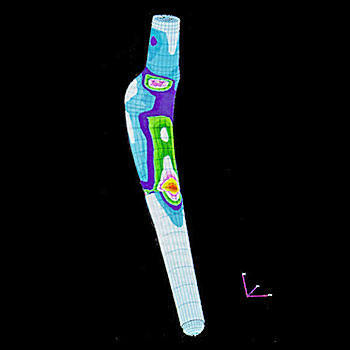 The stress analysis of hip endoprostheses is normally carried out by analytical methods. For complex geometries and/or material behavior, a FE analysis is advantageous from an economic point of view. The plot on the left hand side shows the stress distribution in a hip stem made of CFRP (carbon fiber reinforced plastic). The anisotropic material behavior and the NURB-surface require the FE method for stress determination. As well as stress analysis forging processes can be simulated and finishing techniques can be optimized.